Identification: Tailless. Upperside dark brown; female with dark borders. 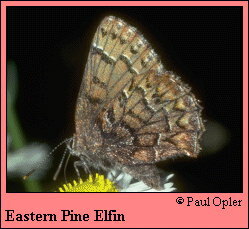 Underside banded with dark brown; hindwing with submarginal gray band outside row of black crescents. Life history: Males perch on tops of pine trees in the sun to find receptive females. Eggs are laid singly on new needles of young trees; caterpillars feed on the needles. Chrysalids hibernate and adults emerge in the spring. Caterpillar hosts: Various hard pines including scrub pine (Pinus virginiana) and jack pine (P. banksiana), and the soft white pine (P. strobus). Adult food: Nectar of many different flowers including blueberry, cinquefoil, chickweed, common milkweed, and white sweet clover. Habitat: Areas with small to medium pines such as forest openings and edges, and old fields. Range: Nova Scotia west to eastern Alberta; south to northern Texas, the Gulf Coast, and northern Florida.